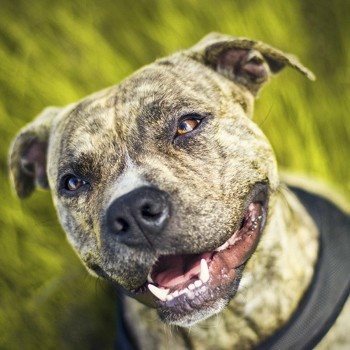 GARDEN ROUTE NEWS - The Garden Route SPCA is alarmed by the increasing number of pit bull terriers attacking people and wants the public to be educated about the nature of this controversial breed. "The public needs to be educated about this power breed," said senior SPCA inspector Salomé Bruyns. "Most pit bulls in the townships are kept illegally chained or caged, which makes even a docile dog aggressive and territorial. Dogs are naturally territorial animals and when they are confined to a small space, this instinct is enhanced and they become neurotic, anxious and aggressive," she said. "For everyone's safety, we are forced to humanely euthanise any pit bull that wounds a person seriously." The original American pit bull terrier was selectively bred to fight dogs but also to be compatible with people. Irresponsible breeding has led to some pit bulls being dangerous to humans. Selective breeding involves choosing some natural attributes of the animals; innate behaviours that give the animal satisfaction and pleasure through the release of 'feel-good' hormones and endorphins, which trigger euphoric feelings. "For instance, the border collie loves stalking and herding other animals and the collies with these attributes are used for breeding," says Bruyns. "Collies that tend to bite are not used for breeding, as these qualities are not acceptable in herd dogs. Thus a breed becomes 'genetically modified' through selective breeding. When people started 'developing' the American pit bull breed, they wanted a dog that was very strong, with great stamina and that wanted to fight with other animals but be submissive towards humans." She explains that, as these dogs were originally used in pits to fight each other, humans had to be able to get into the pit safely to separate these dogs without being bitten themselves. Any pit bull that showed any signs of low tolerance towards people was never allowed to breed and in many cases culled immediately. The breed became popular in the 1980s because of its high tolerance towards people. They were left alone with children and the 'nanny dog' myth was born. "More people wanted them and started breeding them all over the world without taking selective breeding into account. Dogs with lower tolerance towards people were allowed to breed and slowly pit bulls that were low in tolerance towards both animals and humans were created." She said the problem with such an animal is that it gets pleasure from fighting dogs and attacking people - and the more it repeats these behaviours, the more addicted it becomes to the euphoric 'high' it gets. Bruyns said it has been proved worldwide that rehabilitation or re-homing of such a dog is impossible and compassionate euthanasia is needed. "Owners of even mildly aggressive dogs are required by law to display a sign warning passers-by of a possibly dangerous dog. The walls and fences at these homes have to be high enough to keep the dog safely enclosed. Owners face a R1 000 fine for contravening these municipal by-laws." I'm a 44 year old woman looking to meet men between the ages of 41 and 59.